The 250-500cc cruiser segment is a niche category in the Indian motoring industry. The Chennai based bikemaker, Royal Enfield dominates the segment with its most selling motorcycle, the Classic 350. With an aim to bite in the segment, Honda is being expected to introduce a new cruiser in the market soon. Also, the earlier announcements of bringing a product in this segment sports these speculations. However, there is no such cruiser from Honda in its current lineup. Other than Honda, there are many who have tried to compete against the Royal Enfield. And, several others are looking to sneak into the market share. The cruiser which was being believed to be the Rebel in coming time. Nevertheless, not such motorcycle appeared on Indian roads since now. Somewhere, the inability of pricing motorcycle at par the Royal Enfield could be a concerned reason behind. 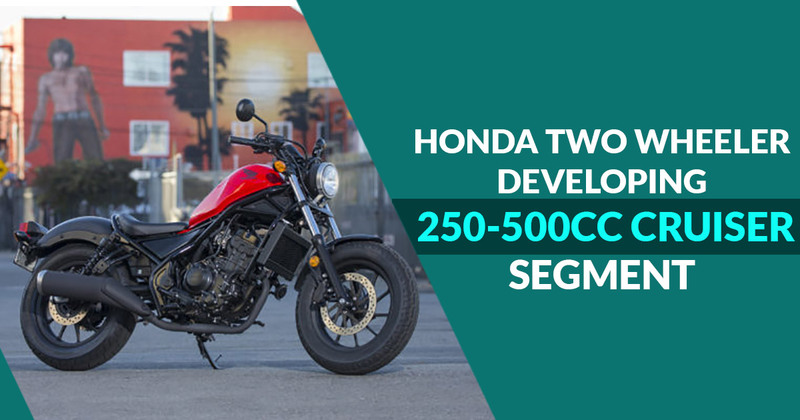 Well, as per a proverb, it’s never too late, not yet, though in the coming future we could meet with a cruiser from Honda in the 250-500cc segment. As of now, Honda needs time to find a fierce rival for Royal Enfield. Nonetheless, there are bikes likes the Bajaj Dominar 400, UM Renegade Commando among others to compete with the thumbing Royal Enfields. None of them, even stand firmly against the RE and scattered. Now, there is hope on the upcoming Jawa bikes and the Benelli Imperiale 400 which are yet to hit the Indian soil in near future. Till then wait and watch, will these newcomers be able to stir market in this niche segment?